Run Waves reverbs, EQs, compressors, limiters, delays and other award-winning audio plugins in low latency directly from your Lawo live sound console. You can now run Waves’ GRAMMY®-winning reverbs, equalizers, compressors, limiters, delays and more directly from your Lawo mc2 console. Lawo mc2 consoles now integrate with the MultiRack plugin host and sync the storage of SoundGrid plugin parameters in snapshots and production data. 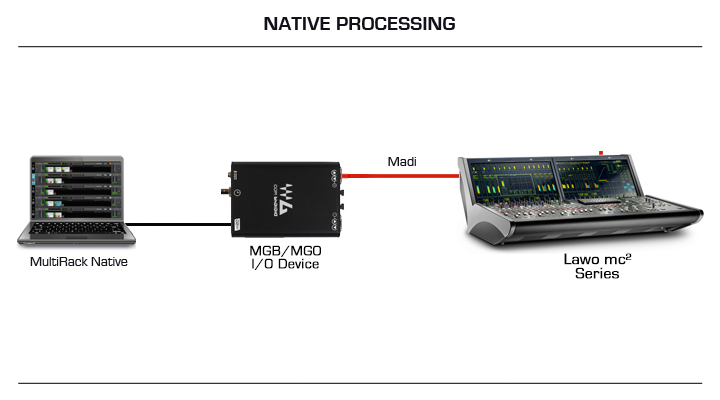 Simply connect your console to a SoundGrid DSP server and a SoundGrid host PC using a DiGiGrid MGO MADI-to-SoundGrid interface, and you're good to go. In a SoundGrid system, a dedicated SoundGrid DSP server powers the plugin processing, enabling low latency and high plugin counts. 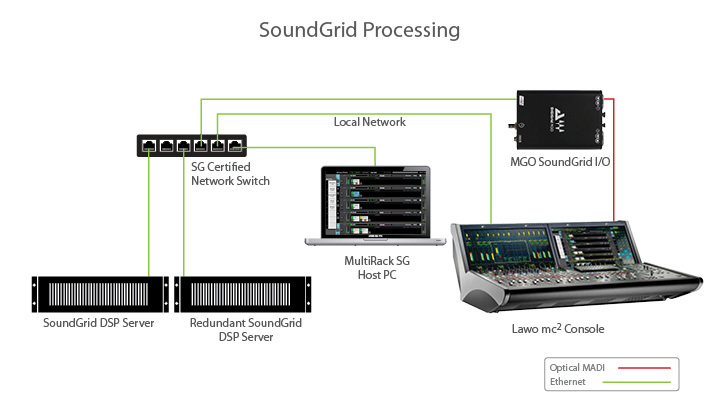 The SoundGrid configuration also gives you advanced networking capabilities and enables you to add a redundant SoundGrid DSP server. Creating, naming, opening and saving sessions. Files are managed entirely through the console. When you save a production file on the console, the corresponding session file is automatically saved by MultiRack. Creating, naming, loading and storing snapshots. Snapshots are managed entirely through the console. Navigation to racks and plugins, as well as plugin selection. Navigating to a specific plugin can be done through MultiRack or through the console. MultiRack can also be controlled through the console’s Remote Desktop connection. MultiRack SoundGrid version 9.80.13.212 is compatible with Lawo consoles version 5-6-0-16 and higher.